Dreams do come true. No, I'm not talking about this whole church plant thing, I'm talking about something even bigger than that: they're making a sixth Rocky movie. 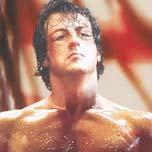 Yes peeps, Sly Stallone is back to reprise his greatest role- Rocky Balboa, the Italian Stallion. The original. Sure, it was slow, but did you know it won the Best Picture Oscar? And Stallone was nominated for Best Actor. Crazy. 1976 must have been a slow year for movies. They finally get it right: Balboa beats Apollo Creed in the rematch. Obviously the best of them all. Hulk Hogan, Mr T, and Mickey dies. Epic. A little lame, but the fight at the end against Drago [despite being totally unbelievable] was the best match in the series. Embarrassing confession: I owned the Rocky 4 soundtrack. The absolute worst movie ever made. And I'm not limiting that to the Rocky movies. It was ridiculous. I'm still trying to figure out who paid money to get that trash made. Tommy Gunn, Rocky's protege was an actual boxer, not an actor. Unfortunately he wasn't very good at either. I'll admit that I'm interested in seeing this sixth movie; they really needed to do it after the last movie [did I mention that Rocky V was horrible?]. The whole franchise is in need of redemption. While there's not much info out about the film, there is one piece of startling news that's been released: Adrian will be dead. After Adrian's death, Rocky develops an affinity for men who play cello. After his match he yells out, "Yo Yo-Yo Ma!" The Italian Stallion returns to school to become a history teacher, specializing in rulers of the Roman Empire. At the end of a stirring lesson he declares, "Yo Hadrian." Rocky, still living in his dilapidated Philadelphia neighborhood, falls in love with music videos from the 80's and 90's. After his cable goes out he cries out, "Yo MTV Raps!" Balboa becomes depressed after his wife's death and over-indulges himself on Mexican Food. After kicking his chiuaua, he demands, "Yo quiero Taco Bell." OK, that's all I got. You know, the worst part about this new movie is that it's not due out until next Thanksgiving; we have to wait a year for it to come. That's a long time. Until then, I'll be in training: sit-ups, push-ups, jumping rope, running on the beach, eating lightning, and crapping thunder. Older PostLet the earth shake!